Ranveer Singh stars in Rohit Shetty’s Ranveer Ching Returns! It’s been one of the most closely guarded films & sets of all time… the whole cast, crew were committed to sign non-disclosure agreements, mobile phones, cameras being off-limits. So when news broke of hit juggernaut Rohit Shetty signing the most exciting young superstar of today, Ranveer Singh, the Internet was already on fire. The first look poster and trailer of this much-anticipated venture -‘RANVEER CHING RETURNS’ is out now!! The first look showcases MASSIVE sets, H-U-G-E action set pieces and all the ingredients of a H-U-M-O-N-G-O-U-S commercial blockbuster and takes both Rohit and Ranveer in to territories they’ve never explored before. Set in a dystopian future, the film is apparently an Indo-Chinese collaboration, and is set to release in multiple languages globally with dubs even in several South languages. The film also features South superstar Tamannaah who is being paired with Ranveer for the first time. Both Ranveer and Tamannaah were unavailable for comment. The film is scheduled to hit cinemas worldwide on August 19th, 2016. A massive premiere has been planned in Mumbai. It will be followed by a BIG digital launch and then the World Satellite premiere where apparently the Sony Television Network has already picked up exclusive rights for an undisclosed figure. 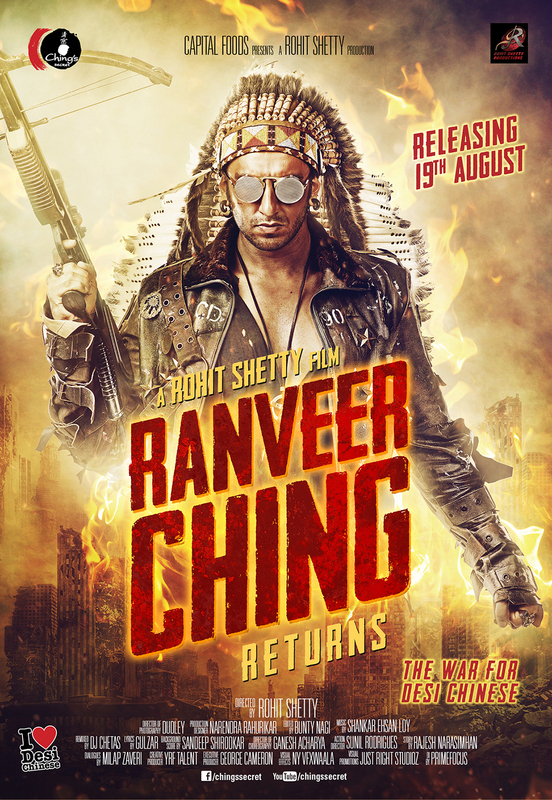 Capital Foods presents Rohit Shetty’s RANVEER CHING RETURNS; releasing 19th AUGUST’16. 15 queries in 1.155 seconds.